It looks great. I have had this as the wallpaper for my cellphone for along time. 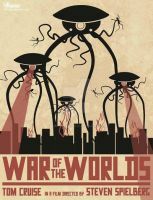 OMG I LOOOOOOOOOOOOOOOOOVE WAR OF THE WORLDS AND THIS IS SOOOOO PRETTY!!!! I hope that didn't sound sarcastic because it wasn't, I am obsessed with it. I have a fanfic about it in my journal and everything. Probably yes xD That's the scariest thing about the movie, not just the movie itself, but the idea behind it. And the weird sound effect they make is just scary, even though it sounds familiar, it's just a really intimidating sound. Tell me about it. Do you have any idea what they uses to make that sound? No I don't. I've searched for it a few years ago but found no information. All hope was lost... the tripods dominated the world... then, over the horizon, the HMS Thunder Child appeared. is that the Hiroshima 'A-Bomb Dome' in the foreground? the artwork is absolutely amazing, good work! This is so fantastic! I love the picture-like quality and the the singularity of the tripod in the center, standing alone! Badass! Yes and we will have to be the chosen few. We'll start all over again! What program do you use to do this? 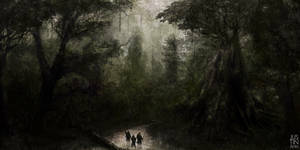 Thanks a lot, I may be re-doing this work from the ground up, as this was made years ago and it's just a photomanipulation, now I think I am able to actually re-do this artwork, and do all of it myself Keep an eye out, and you may want to look around for more WOTW stuff Thanks a lot! You made the ship ultra giant. Should've put it somewhere between the wrecked buildings nearer. Thanks, it is one of the simplest things I've ever done, but for some reason it's my most popular work Thanks for the fav and comment! This is amazing! You did an amazing job! Words cannot describe how amazed I am at this wonderful piece of art! Cool, why only one tripod instead of dosens! The reason for that one is that there is only one good shot in the movie that shows the Tripods this way, and I didn't want to use the same image 20 times Thanks though! Amazing what you can create with a little photomanipulation. I imagine this is what things would have looked like in the end – if it had not been for Earth bacteria killing the Martians. All it's missing is Red Weed, but that would take a while to design in such a complex environment,— and difficult to achieve perfect lighting, too.